So far, this show is pretty cute and falls into that Secretary Kim vibe of a fun contemporary romantic comedy that pokes fun at itself. It is a very meta and actually had an entire sequence about Descended from the Sun and another one on Product placement. They even made fun of the very short skirts that a lot of drama actresses wear in Korea. That scene was short, but so funny. So I have big hopes for this show to keep me laughing until the end. Though I do expect the melo to kick in at some point with that scandal, hopefully they keep that part short. Yoon-seo angrily asks Jung-rok if he by chance does not like women? Do you hate women? She has a hard time getting the words out, but stands firm by what she says. He tells her that he is sorry that he is not meeting her expectations. He moves closer and tells her that he likes women very much, very very much, I am just not interested in you Oh Jinsim, so please, can you be excused. She scoffs, excuse me, if you like women so much then I will give you some advice, change your personality. No woman likes a cranky person like you! He tells her that he is not goin to ask her to like him so don’t worry. She scoffs, I am not worried at all! I just hope you keep your word. What? Are you not conident? he explains that it is not that he is not confident, it is because he has to find the document that she lost and he doesn’t have that much time, Oh Jin-sim. She yells, my name is Oh Yoon-seo! Oh Yoon-seo! Oh Yoon-seo! She storms out. The other company employees wonder what happened. The younger one, Hae-young, says that she thinks they had an argument. They wonder how she knows that. Hae-young smiles knowingly and walks away while sipping her coffee. Meanwhile, Yoon-seo yells bloody murder on the rooftop with how much she just does not like Jung-rok. When she is done, she sinks into her temper and tells herself, “Viviane Lee in Gone With The Wind said, tomorrow we will have tomorrows sun” But she realizes that it is way too cold and windy on the rooftop and tells herself that she needs to be gone with the wind. Inside the office, Yoon-hyuk talks to Jung-rok about being nice to Yoon-seo. She is the perfect women, you know I don’t like most women, but she is prefect, she is a better match for a person like me than you. I think our CEo did not match her up well. Jung-rok straightens up and wonders if he is here to say that? Yoon-hyuk says that he is here to return this. He hands over the folder that Jung-rok is looking for. Jung-rok is all like, you had this the entire time? Why didn’t you tell me? Yoon-hyuk apologizes and says that he needed to have a look at it for his case, lets understand each other. We are busy people in this era so lets forgive each other for small mistakes like this. Okay? he smiles his mega watt smile and leaves with a salute. Yoon-seo comes back from the rooftop and glares at Jung-rok, then she goes to her desk and angrily scratches out several items on her to do list. He comes out and tells her that he is going to the courthouse and…..I am sorry. She asks what he is sorry about. He explains that Lawyer Choi had the document that he thought she lost, sorry to accuse you. She makes it clear, so it was your mistake, not my mistake? He agrees. She stands up and rails into him that he should not stop at an apology, I am already hurt. You are the one that lost it! Why accuse me! From now on, don’t do those things anymore. So when I clean your desk you should not be cranky and you should be thankful. He explains that that is not the case, sorry for my inconsideration. But I clean my desk with my own rules, so please do not touch it. Goodbye. He leaves quickly. Yoon-seo wonders if he was apologizing to her or arguing with her. While walking out, Jung-rok runs into his boss, Joon-kyu who reminds him about the welcome party. Jung-rok says that he has a meeting with a client. But CEO Yeon tells him that he should go since it is his secretary. You should come, if you don’t then Yoon-seo will be sad. Jung-rok thinks it is Yeon’s fault for assigning her to him. He walks off. The CEO goes to the elevator and sees Moon-hee in a tidbit with a client who says that she is making him a criminal! He walks off. CEO Yeon walks up to Moon-hee who is trying to stop her client from leaving. She tells CEO yeon that her client is rich but does not want to pay his taxes. The CEO tells her that it is important to be righteous but we also need to pay for our building (sarcastically). Good job, good jobHe pats her on the back with a smile and hops in the elevator. Cut to several prosecutors sitting around a large meeting desk in a conference room. Yeorum tells her boss that they have enough evidence so he tells her to wrap it up nicely. Another prosecutor brings up the a woman that murdered her husband, he wants the case so he can give her a good sentence. Another guy says that she murdered her husband with a knife and her ex-husband died via a fire. There is something suspicious here, maybe the ex-husband was murdered too? Yeorum is not comfortable with this line of thinking and asks why he is thinking this way. He says that he saw the investigation report and immediately thought the woman was a temptress. He felt it. Yeorum rolls her eyes. The boss tells Yeorum that Kim Sewon is coming back right? He is coming from tomorrow. Yeorum is shocked to hear it. Another prosecutor asks if they don’t talk after breaking up? The boss tells her not to make any trouble with her personal business. I will not give you a second chance. She understands. Yeorum leaves and catches the elevator, when the doors open, Kim Sewon is standing in the elevator like a JCrew model. She is stunned. he straightens up when he sees her and tells her that it is nice to see her again. She steps into the elevator and they start to make small chat, though she does not look at him. She says she heard he was coming to the office again. He says that happened and asks how she was, she asks if he met the director and he asks if she had lunch. She said that she did. he tells her that she should eat more, she is skinny. He then gets off the elevator. She looks a bit upset at the last comment. Later on, Manager Kong asks Yeorum if she wants him to come with her to the welcome party? She says that she will be fine, she is going to be at the party with all her dignity, don’t worry. But then we cut to her drinking all the alcohol. YS – I just wanted to work hard, I wanted his compliments, I cleaned so much, you know that. YS – But! My lawyer was angry and ignoring me, maybe he has an anger management issue? YH – Yes, he has some. I made a personal mistake and he was so serious about it. YS – Yeah! Yeah! *she pints at Yoon-hyuk and he points at her* But…why isn’t lawyer Kwon coming? I need to tell him something. MH – And become a couple…. YH – ….and become a couple…wait, what did you say? MH – SOrry, I thought you were interested in her. JK – You shouldnt be interested in her! How dare you be interested in her. YH – How can you say, how dare I? I have good looks and personality and money and am good to my mother. YH – Yes I am a mommas boy….hey, lawyer Dan, do you want to fight with me! MH – SOrry, I am not good at fighting. Sorry. Eunji wonders if it is okay with Yoon-seo and Kwon. Hae-young says that the tabloids say say that she has a temper when she is angry. Maybe she will throw everything when it gets too much. Teh CEO tells them not to worry and wonders when lawyer Kwon is coming. Yoon-seo wakes up right away and asks, WHERE IS LAWYER KWON. She stands up and looks at manager Doo-seob, she wonders why Lawyer Kwon looks like that. You are even scarier looking now. Jung-rok gets offered more alcohol but he says that he never drinks with his clients. he will try to find common ground with the other lawyer. Then he gets a phone call. Back at the party, Yoon-hyuk talks to his mother on the phone and asks what she might like about an entertainer daughter. She says never ever so he throws a bit of a temper tantrum but then sees other people and straightens up. The team all comes out and says that they aren’t doing another round, it is time to go home since everyone is tired. Yoon-hyuk asks where Yoon-seo is, the CEO says she is talking to her manager – no – her cousin. She is talking to her cousin. Eunji says she has to go home due to her kids hogwan time. The CEO tells the manager to go home with her since they live in the same spot. The manager tells everyone, “Like a bubble from the beer we had this evening, have a fulfilled evening.” They both walk off. Hae-young is so confused about the beer bubbles, what does that mean? The CEO is all like, I don’t know. Then they all see Lawyer Kwon show up, he says that his meeting took a little longer than expected. Yoon-seo comes drunkenly walking up and says that she has a lot to tell hiiiimmmmm! He asks if she is drunk. She is all like, noooooooo I am not drunk, lets talk with a cl-ear mind! She is about to tap his shoulder but he avoids it so she axidentally pushes a trash can on rollers and pushes it several feet across the floor, she ends up falling on the ground and glaring at him. YS – Did you push me to the floor! Jung-rok is all like, um…. Cut to Jung-rok driving home, sighing in his car, then gettin gout togo to his place. Then Kim Sewon calls his name and runs up. He tells him that he is going to work since tomorrow and hasn’t found a place to stay yet. Let me crash at your place for a little bit. Did you have a company dinner? It is cold, I waited for you for two hours, lets go. They go inside and Sewon immediately gets comfortable. He throws his coat on the couch and plops right next to it. Then he asks if he had his welcome party for his secretary? Jung-rok asks if he told her who she is? Sewon is all like no, why? Should I know her? Who is that person? Jung-rok changes the subject to yeorum. Did you see her? He says he did but she didn’t even show her face to him, she is skinny now, but still pretty. he tells Jung-rok that this place is great for two people, can I live here? Jung-rok tells him he can sleep on the couch without a blanket. Sewon asks if he can sleep next to him, JR is all like, shut up and leave. But instead, Sewon gets a beer from the kitchen. At Yoon-seo’s place, Yoon-seo is so embarrassed about her evening. Her manager tells her it wasn’t so bad and you shouldn’t say embarrassing (he actually said a slang word for embarrassing). She asks why? In this situation that is the perfect word. How can he just throw me on the floor! that a-hole! manager Kong says that he heard he didn’t throw you on the floor from others. She glares at him. So he changes his tune and says that he should have held her! Then she wouldn’t have fallen on the floor! She glares and says that she will get her revenge on him. He asks how she can do that? I can help you! But she says no, I can do it by myself, I will be the perfect secretary and make him a guy that cannot do anything without me. Three months later, when I quit, he will feel my absence and cry. Manager Kong says it sounds more like revenge against a boyfriend. YS yells, I WILL GET MY REVENGE ON KWON JUNG ROK AND GO TO HEEEEEEEEEEEEELL. The next morning, she gets to work super early with the manager, unbuckles, and says that no one should be at work this early. The manager says that it is 8am so no one should be here. It is embarrassing to see people anyway so go in early and stay in your office. YS says that she will work so hard from this day forward. He tells her all kinds of encouragement as she gets out and walks in. But he also thinks that she shouldn’t be too crazy. Yoon-seo gets to the office but is not the first one, Doo-seob is there. He puts a leaf in a book. The other three women are already there too. They all come out and greet her. They also ask if she is okay, do you have a bruise? Eunji does not know what is happening so Hae-young explains it all about Lawyer Kwon coming late and Yoon-seo wanting to tell him something so she charged on him and fells and lost her balance and lawyer Kwon did not hold her, he just avoided her. EUnji is al llike, what? Lawyer Kwon didn’t hold her? Haeyoung says that YS tried not to fall so she held the trashcan and stumbled all the way to the other side and finally fell. Eunji does not understand so Moon-hee explains by running, falling, and then holding a rolling chair that rolls away. Eunji gets it now. Yoon-seo is all like, um…it’s okay…it’s nothing…ha ha. But she closes her office door and wonders how they all came to work so early, so embarrassing. In the lobby of the building, the CEO tells Jung-rok that he went too far, he should have help on to her, how come you avoided her? he kicks his leg out. Jung-rok says that he didn’t kick his leg like that. The CEo tells him that he has to instinctively hold someone that falls. He throws his bag to make his pint, but Jung-rok does not catch it. CEO Yeon is all like, how can you not catch it? You are so strange. If other people saw it then it would be embarrassing, it could be on websites and things. It should be so embarrassing to an actress. What if she does not come. Jung-rok wonders, what if she does not come? The CEO is all like, if Yoon-seo does not come to work then you should also not come to work. JR is all like, do you mean that? The CEO tells him, of course not. Please just take care of her well, for my cousins faith, please just treat her well. He is a cute guy. They walk off to the office. Yoon-hyuk tells Jung-rok that he never knew he was that cold, I am so disappointed in you. Eunji tells him that she just heard about it, but he went too far yesterday. The manager nods next to her. Hae-young tells him that it wasn’t just a little bit, it was really bad. It seems like she is super depressed, what are you going to do? Moon-hee says that she didn’t even get flowers during her welcome aprty, just humiliation, why did you do that? She sulks. he looks at her for a long time so she apologizes and says that she will apologize if he is mad! She extends her hand. He just looks at everyone, sighs, and walks into his office. Yoon-seo greets him happily and tells him that she can get his morning coffee, I decided to be the perfect secretary. He starts to talk about yesterday, she thinks, is he about to apologize to me? I will accept it if he does. But he just says that she drank too much yesterday, she should drink less. She is about to lose her mind again but holds it in and says that he should not give advice to her, he should apologize to her. Because of him she fell on the floor. He says that she fell all by herself. She is all like, so you think you are not guilty? He says he feels moral responsibility for it. She is all like, moral responsibility? Yoon-seo says a law term, willful negligence! it is an injury caused by wilful negligence. You knew that if you did not catch me then you knew I could be injured. I was drunk and could not even stand straight but you neglected me. he tells her that she knows that law a little bit. She looks off and says that she went to law school. But that is not important. If you have a counter argument then tell me lawyer. He says, what about your behavior, you drank so much and could not control yourself. You should have known based on how much you cna drink that if you exceed that it will be dangerous to you. that is also willful negligence right? Okay. he walks to his desk. She is all like, okay? Okay. Okay Okay?! Scene change to Sewon meeting with his prosecutor boss about coming back. he thanks him for calling him back and chuckles about being in the proper line. He also chuckles and asks if he saw all the case files? He is sorry to give him work as soon as he came back. But Sewon says that he knows that is why he called him. SO, is CEO Jung the person that was indicted in a foreign country? The boss says that Park is on that case, but Sewon needs to investigate the secret money, they have a witness. It was too noisy before so they could not prosecute him. Sewon wonders if his boss wants him to be responsible for it all? the Boss says that he thought it would be difficult to investigate the case even for a crazy guy like you. Sewon thanks him for trusting him. The Boss says that it will be difficult to do himself so he will send him another person. The meeting ends so Sewon walks out and sees Yeorum in the hallway. He goes to his office and greets two other people who work there. Another person comes in with a box and says that she is prosecutor Lee Joo-young, she knows the case well after working with her mentor. Sewon tells them this is all good, let’s have a meeting in three minutes. They are basically all like, 3 minutes? I heard he was crazy but this is crazy. 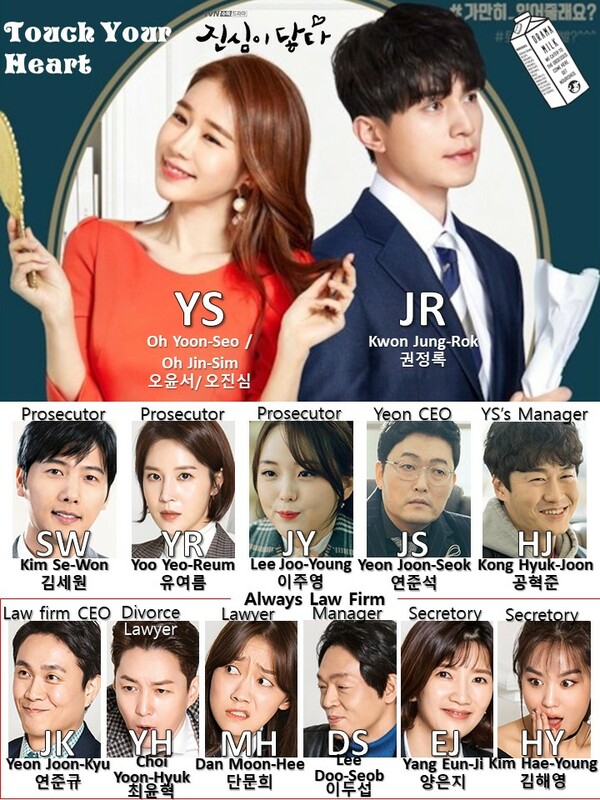 In the lawyers offices, Yoon-seo is able to connect a call to Jung-rok easily. She smiles at him as he talks to the person and then gets back to work. He ends the call and tells her that he has to leave and cannot eat lunch with her. She smiles an says that she will take care of her own lunch. he leaves. Yoon-seo breaks her acting and wonders what she will do for lunch. She calls her manager and asks for him to bring her lunch. He is meeting with the CEO and tells him that Yoon-seo wants to eat Pho. They talk about how yoon-seo is so pretty when she eats right? Right? I liked how she ate, that is why I picked her on the street. She was really pretty. The CEO is eating street food and calling someone. He tells the person that he is not good as a manager, should I just get a loan and open a bar? Okay, lets drink soju, can you buy me some? Okay. He gets off the phone and looks over at a local high school. One of the girls is Yoon-seo who takes the goomokbang from her friend and immediately moves into a natural commercial with the food. CEO Yeon is star struck with the high school student. He ends up making a similar kind of commercial with her with chocolate (this was actually a real commercial from Korea, it is an old commercial). The CEO says that she became a super star with that commercial and his business also sky rocketed. He wants to see his Yoon-seo become a star again. He starts to tear up and wonders why he is crying. Manager Kong thinks he might have post menopausal symptoms, he heard you cannot control your emotions. The CEO is all like, really? Okay, shut up. Then he gets a call that he takes quickly. After that he tells Kong that he needs to go on Minji’s local location shoot because her manager is sick. Kong says that he has to take Yoon-seo from home to work. The CEO is all like, she can take a taxi. you buy the pho, that is it. Minji is a rising star now, don’t you know those things as a manager? What, you dont’ like it? he takes the Pho to Yoon-seo, she eats it in the car. She tells him that he is the best, now she feels good. He asks why she does not eat with the others? She tells him that it is so embarrassing. Kong asks if her lawyer apologizes she says no, he said nothing is wrong with him. The manager starts to say that he wants to see him so he can give him a piece of his mind. But then Yoon-seo sees him so they both crouch in the car. The manager is all like…wow, he is handsome. She tells him no! Look at him again! The manager is all like, he is handsome….but when I close my eyes, he is not handsome! So, why are we hiding? She tells him that he thinks she got a job to restart her life again. But it is not so gracful to eat Pho in the car. I need to leave. The perfect secretary will not leave the office. She runs off (her running arms are so funny). The team is dinking coffee in the office. They wonder why she is not eating with them? Eunji says that it is not that she is not eating with them, it is that she is not eating at all. Maybe it is so embarrassing to eat with them. But someone heard when she was drunk that she cannot eat alone. They saw her eating multigrain tea when Jung-rok is not around. Jung-rok came in and heard all of this. But he does not make himself known. he goes to his office, Yoon-seo comes in after him and asks why he is standing there, do you want anything? He tells her that they should eat, you drank a lot last night, so how about Pho? She is all like…um…I am okay, I am on a diet. I thought I had to do it all of a sudden. he is all like, okay then. he goes to his office. Cut to Subway where Yoon-hyuk is enjoying a meal alone. But then he sees Moon-hee straightening herself up in the window and applying lipstick. he wonders why she is doing that. then Moon-hee comes in and starts talking to the handsome Subway guy. He asks if she wants honey mustard and break like usual? She is all like, honey….how do you remember it? He says that she is a special customer, you look like my Grandmother, I feel like you are a family member, can I call you emo (aunt on sisters side)? She is all like…..um…..okay. She turns around and makes eye contact with Yoon-hyuk and then runs out. Yoon-hyuk follows her with his jacket drapped over him like a count and asks her why she is leaving like that? She is all like, you did not see all those things. He is all like, I was focused on eating, I did not see anything. She is all like really? He says yes, I did not see that the employee that you like thinks of you as an emo grandmother. Haaaaaaaaaah! But he tells her that she can fall in love with someone else quickly since she is gumsapa (someone who falls in love quickly). She speed walks away. In the office, Yoon-seo asks Jung-rok if he would like to have a cup of coffee, he says no. She tells him that it is 3pm, this is the time that people feel most tired. For you to focus on your work more, I will make you a cup of coffee, she runs off. he thinks that she does not have to. In the break room, Moon-hee talks to Hae-young about how embarassed she is that Yoon-hyuk saw her like that. Hae-young says it wasn’t the first time. Moon-hee thinks that she should be a little pretty like Oh Yoon-seo, then she won’t be humiliated like this. Do you think she ever felt like this? Hae-young thinks definitely not, a lot of male entertainers think that Oh Yoon-seo is the ideal type. She is popular, that is why she had a scandal with a 3rd generation chaebal. Yoon-seo overhears them. They start to talk about the drug scandal and how she was not guilty. But Hae-young says that she just wonders what her relationship was with the chaebal, she aws there right? But if they don’t have a relationship then they should not be together right? Hae-young starts to talk about the tabloids when Yoon-seo comes in. Jung-rok overhears all of this as well. Yoon-seo happily greets the two of them as if she didn’t hear anything and talks to Moon-hee about how her makeup looks pretty today and chats happily with them. Jung-rok sees this as well. He goes back to his seat where she delivers his coffee to him. he thanks her and then she goes back to her desk with a bright smile. But he sees her smile break for a moment when she sits and sighs in her seat. After work, she rides home looking sad with her manager. He asks her what happened, she smiles brightly and says it was nothing. But he wants to know if the lawyer gave her a hard time, I will call the CEO and change the lawyer. She tells him that it is cool, she is working on her revenge as the perfect secretary. She had a lot of revenge today, she forwarded a call and made a copy and made him a coffee. He tells ehr that she did a good job, but from now on you need to go to work alone, I have military training. She wonders what she should do tomorrow. He said that she can take the taxi, she says she doe snot want to take a taxi, people recognize her and it is uncomfortable. He says that he wants to be with her but has to go to training. She tells him to have a good training and wonders if he actually went to the army. he tells her of course! I went to a very difficult place! Am I soft to you? I can drive faster. He zooms off quickly. Elsewhere, Jung-rok gets home and talks to Sewon about finding his own place. Sewon thinks he is the perfect roommate and even ordered a dinner lunch for him. He calls himself the perfect roommate, right? DOn’t you want to live with me forever? Why are you so cranky? He tells him that Yeorum might call him to have a drink, she might be under stress because of me. Jung-rok tells them to take care of their own stuff. Sewon says that Yeorum likes him and trusts him and relies on him. JR says that if she does then he should have picked him from the beginning. Sewon tells him that he is too cranky, change your personality. I am your roommate now but no one else will be your roommate. The new secretary will have a hard time adapting to you. Jung-rk tells him to shut up and then goes to his room. In his room he thinks about the document fiasco where he blamed her for losing it. She told him that she tried hard, do you have to be so mean? If you teach me then I can do it. he also thinks about Yoon-seo overhearing the tabloid gossip and then pretending that she did not. The next day, Yoon-seo drives like a super star to her workplace. But actually, she was parked in her house the entire time. She thinks that she will have that feeling! Then she turns on the car and puts it in drive. But she is so super duper slow. She might get a ticket for being so slow. People yell at her in their car about how slow she is driving and one man tells her to get out of her car! He pulls up in front of her and does not move. She wonders what she should do, did she make an accident? She has a vision of the news that will come out about her making another accident. The man comes out of his car and starts yelling at her and banging at her car and telling her to get out. He says he will break her car if she does not get out! He is about to hit the car again but then Jung-rok holds his arm and tells him to talk to him about it. The man says that she broke his car. But Jung-rok says that what this man is doing is revenge driving, according to the law you can go to jail for one year or have a $500 won fine. The man yells that she hit his car from behind. Jung-rok tells him that they can check the black box and see if you cut the line without a signal. That should be there. The man laughs and says that his car did not break too much. Lets have a compromise. Okay? He smiles. But Jung-rok says no, lets follow the law, I like the law a lot. Yoon-seo looks at Jung-rok in amazement. They both ride the elevator up. He asks why she is looking at him like that, she is all like I am not looking at you. Why are you looking at me. He says that he wonders if she has to go to the hospital? She smiles and says that she is okay. But then she asks how he knew it was her. He says that he saw it. Flashback to the accident and the crazy man yelling at her. In the elevator she tells him thank you for stepping out for me. I will work harder to pay it back! He is all like, okay, do what you do. The elevator stops and the CEO gets in. he smiles at them both. But then he tells Kwon that his face is always stiff, he should be happy after seeing Yoon-seo in the morning. Why are you so cold? People will think you are worse than strangers. Smile, smile. They get off the elevator. Jung-rok walks ahead to the office. The CEO walks with Yoon-seo and says taht she will feel like she is in Siberia next to Kwon, but The CEO will help her. If he gives you a hard time, just tell me. Never think about quitting. Yoon-seo smiles and says that she thinks he is a better person than expected. The CEO is all like, excuse me? She says it is nothing and walks off. He wonders if he heard her wrong and walks off to his office. Later on, Yoon-seo yawns and makes eye contact with Jung-rok and then stops. He goes up to her and asks her about law school. She says she quit, she wasn’t fired, her schedule was too busy. He asks if she knows how to search cases? If you go to the library then you can find a lot of cases. He needs her to find a case on the lawsuit that involves a dog barking. Or a case about noise between neighbors. She tells him that she will do her best as this is her first assignment. Later on, she tells him that she did not find too many, especially with a dog. But she did hear about this somewhere and found something in America. She remembers a news article in America, someone won a case with the neighbors dog noise. Do you know how much it was? $500,000, that is big right? He asks when she heard it? She says that she heard this in a mock case in law school. She remembers that another group presented it. he tells her that it was a long time ago, but you remember that? She smiles and says that she has a good memory. no one compliments me with acting, but they compliment me with my ability to memorize all of the script. Well, I am not bragging about it. He tells her that she can brag about it, it is helpful, thank you. She smiles at the compliment and then goes back to her desk. their music kicks in as she wonders how he is so busy all the time, is it because he is a law firm ace? Well, he said he does not like people who don’t go home on time. Should I really go home? he keeps working into the night and checks his time for the first time. he wonders how it is already so late. Then he gets up and checks his secretary. She is sleeping but the last thing she wrote on her computer is that she is hungry and then it is a bunch of nonsense do to falling asleep on her key board. He knocks on her desk a couple times. She wakes up and says taht she was not sleeping, she was just thinking about his schedule tomorrow. He asks why she did not go home yet. She says it is just in case he asked her about something. He asks ehr to go to eat. She wonders why he is so kind to her today. You took care of my accident and gave me things to do and complimented me and asked me to eat together, it is so strange. Perhaps…..you are firing me! You were nice to me because it is my last day?!? Is eating dinner my farewell party??? He tells her that it is not that, he just wants to eat dinner. She quickly fixes her very messed up hair. Cut to the two of them eating intestines at an empty place. She asks if he comes here often? He says no, the food is bad, but you said that you don’t like going somewhere with a lot of people. She says that no one is here to recognize her. So she takes off her shades when he asks if she is going to keep wearing them. She takes them off and spots a soju add, she mentions that she did that add once. Then she does a little commercial on the soju. Jung-rok is not impressed. She tells him that she makes her feel embarrassed and asks if she can drink a lot today. he tells her that she drinks a lot all the time. But she says that she did not feel good at the welcome party so she drank, but she feels good here so she is drinking happily. The owner comes in and says that they need to change this soju poster. They take off Yoon-seo’s poster so that they can add another one. Yoon-seo whispers to Jung-rok that they picked a good spot, if they recognized her then it would be embarrassing. Jung-rok tells her that she is stronger than she looked. She says that she was trained in the entertainment industry, poeple spread rumors about mea nd spread bad comments and something I did not do is circulating all around. i was enduring that for 10 years so I am used to it. If I say I am perfectly okay then I am lying. He asks if she likes working in a law firm. She says that it was difficult but today she had something to do and he complimented he and she has a dinner bonus. Afterward, they both leave, He notices her poster in the trash. She tells him goodbye but it does not look like she sees the poster. He calls her name Oh Jin-sim, she turns around. he tells her that he did not look at her as his secretary since she would leave soon, he looked at her as a bothersome thing, but now he will change it, he will give her a proper chance to work as his secretary, lest start over. he extends his hand for a handshake. She happily moves to take his hand and tells him that she will work so hard this time! But she trips and falls! This time he holds on to her. They are both stunned. After straightening out, he tries to say something. JR – Well, I did not avoid you this time. It looks like the Korean title of this show is Jin-sim e dat dah which is a play on words with her real name. Jin-Sim means True Heart and Dat-dah is Touch. So The English title is Touch Your Heart, which is pretty much a literal translation, but the Korean title is a play on words with her name, “Jin-sim“ and the word “true heart.” That is probably why Jung-rok always calls her Jin-sim instead of her stage name of Yoon-seo. VO – It is suspicious, okay as a secretary? JR – I wrote your work here. YS – He said he will give me a chance to properly work, but now he is giving me so much work. YS – Do you recognize me? YS – The witness, you are lying. JR – What are you doing? YS – Yes, what are you doing! VO – What Yoon-seo went to the police again?! Previous Post Drama Milk YouTube Channel!!! Honestly, I’m still on the fence about this show. I like both leads, and I think both are both pretty good about picking their shows. The first episode was hit or miss, but this second one was an improvement. I thought the flashback by the head of the talent agency was hilarious. It the first time I thought the riff on the commercial worked. One thing this show made me really appreciate was Park Seo-joon. He isn’t in this drama, but he had so much presence in Secretary Kim as the lead actor that I just expected the lead actor in this show to have the same. But the lead actor here is pretty dry so far (though that is probably how they want his character). Am enjoying it so far. It’s quite funny. And the PPL Are hilarious. Especially her enacting acts in his office was too funny. I don’t expect much from this drama. But as long as it keeps me entertained am ok. I like the leads so am ok with it. Not sure how they will fill 16 episodes. Right, I have a feeling that the scandal will fill a large chunk of the later episodes. I finally…..finally caught up with this…i know this first 2 episodes were adorable, but didnt realize its so funny! I shouldnt have watched this at night when everyone is asleep….its so hard to laugh 😂. All those product placements…and the scene from descendants of the sun, this drama is soooo cute! Really light and enjoyable! Thanks for recapping this! I’m enjoying it so far because I’ve loved Yoo In-na since Queen In-Hyun’s Man and it’s nice seeing her in another drama. Do you know if the production team is also the same team behind Jeon So-min’s 1% of Anything? I don’t know why that’s popping into my head all of a sudden. I’m not sure who the screenwriter is actually. Unfortunately I did not watch 1% of Anything so my guessing is probably all wrong. But perhaps the music might be giving you the same vibe? Thank you for the information! 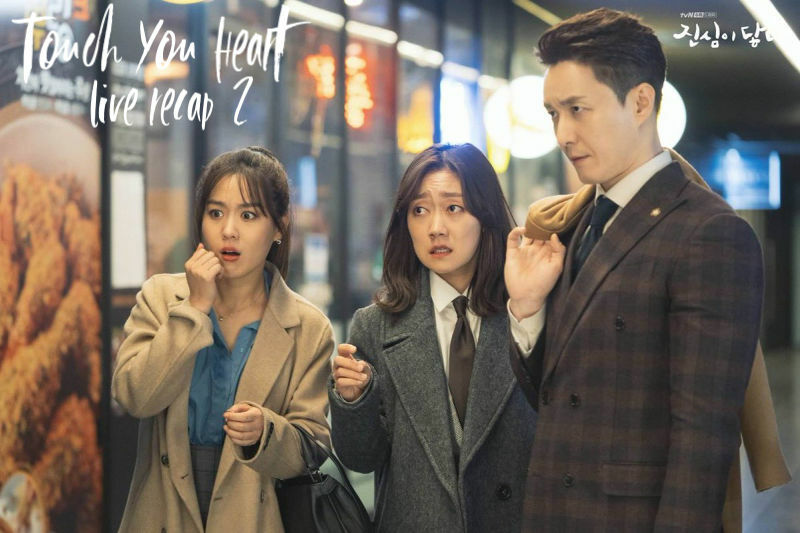 I enjoyed This is My First Life, too, and that’s making me even more excited to see the rest of Touch Your Heart. The first three eps have been fun so far. I love their chemistry and their tension. I love how Oh Yoon Seo really rises to the occasion whenever someone asks her to work. She may be naive at times, but she’s capable and dedicated and pretty quick to get the hang of things! She is very quick on the uptake, I love that!